Grounds Maintenance. The FireFly ESV is Durable and Ready to Work. The FireFly ESV is durable and ready to work. Parks and services operations demand a real workhorse for day-to-day tasks. 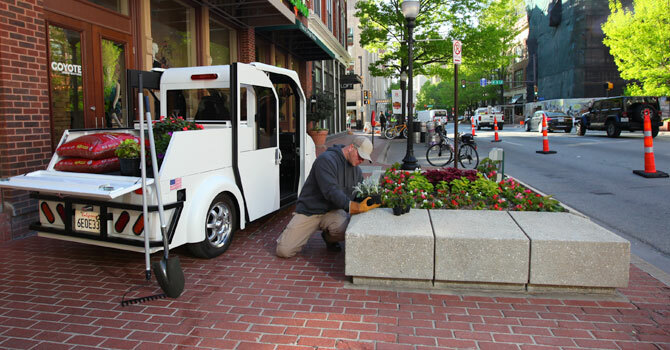 The 100% electric FireFly ESV provides an environmentally friendly utility vehicle for parks and recreation areas. It features a DuraSteer™ suspension, and the three wheel design leaves a very light footprint on turf surfaces. Its modular bed design is built with versatility in mind. Design the FireFly ESV to fit your needs. It’s customizable – the modular bed design can easily be built your way to include a flat bed, lockable storage, sectional bed, van box, dump bed, lift dump, or refuse bed. Efficiency, strength, and maneuverability make the FireFly ESV a great addition to your utility fleet. The 100% electric, zero-emissions FireFly ESV is truly an environmentally friendly vehicle. The tight turning radius gives the maintenance worker the ability to maneuver within tight landscaped areas. The 1,100 lb payload (inc. driver) offers more hauling power and cargo space.